According to no less an authority than Kevin Garnett, Basketball Hall of Fame center Hakeem Olajuwon was apparently one of the most effective trash-talkers in the NBA during his career. In a recent interview, the notoriously intense and intimidating Garnett — a future Hall of Famer in his own right currently playing with the Brooklyn Nets — was asked to name the top three trash-talkers he’s faced. The first two, Gary Payton and Michael Jordan, are no strangers to such lists. “The Glove” and MJ are famous for breaking opponents down with their verbal tactics. But KG surprised many when he mentioned Olajuwon. In addition to being one of the most smooth and graceful athletes to ever make a living playing basketball, Olajuwon is generally known as one of the nicest human beings the sport has seen. Raised Muslim in Nigeria and one of the first NBA players to publicize that he fasted during Ramadan even if it fell during the season, Olajuwon still has a solid reputation as a gracious and soft-spoken individual. And you could still understand him? “He was a nightmare some nights, man,” Garnett later added. Which then begs the question: Is it acceptable for a Muslim to talk trash on the basketball court or any other field of play? For the uninitiated, “trash talk” is essentially the art of psychological warfare against an opponent either by insulting them, overhyping yourself, or both. It has always been synonymous with playground basketball culture, but inevitably made its way up to the pro level and really went mainstream in the 1990s thanks to movies like White Men Can’t Jump and better court microphones at NBA games. Some trash talk can be innocent and perfectly within the bounds of halal for a Muslim. But most of it isn’t; especially that which veers into the lanes of vulgarity and personal insults. Islam teaches Muslims to show good manners and treat others, including non-Muslims, with respect. The Prophet Muhammad (peace be upon him) once said, “I have been sent to perfect the best of manners.” Even in the times of conflict during which the words of Allah (subhana wa ta’ala) that comprise the Quran were revealed to Muhammad (pbuh), Muslims were taught to be kind even in their dealings with enemies. For an athlete, those same principles would certainly extend to their opponents. You can still be competitive and intense and play the game to win — even when that game is boxing or football or judo — but Islam teaches us not to be rude or disrespectful, whether it’s opponents or teammates or officials or fans. 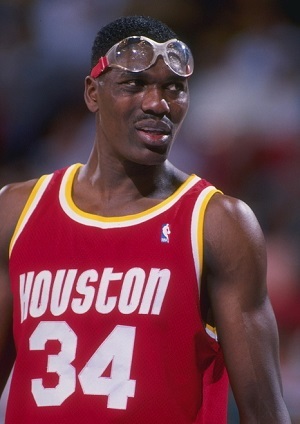 I’ve never played basketball with Hakeem Olajuwon, so I don’t know what kind of trash-talker he was. And honestly, Garnett’s claims are the first I’ve heard anyone say Olajuwon talked trash, so it’s not as if there’s a lot of anecdotal evidence. It’s possible Hakeem kept it halal, and possible he did not. If he did not, may Allah (swt) forgive any transgressions. But it seems believable enough that Olajuwon was able to let his game and his resume do most of the talking for him.